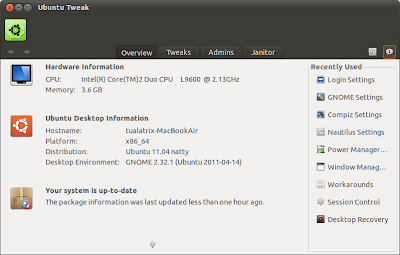 Ubuntu Tweak 0.6 beta has been released with new user interface and all new plugin system. 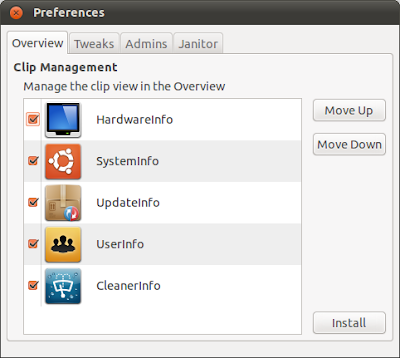 The entire interface is divided into four categories - Overview, Tweaks, Admins and Janitor. Plugins can be installed for all of these categories, though in this release they are available for Overview category only. 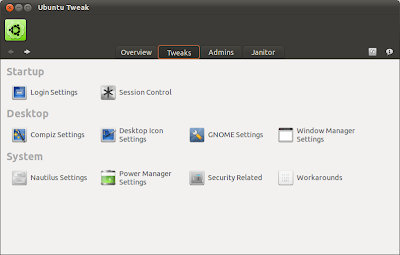 You can install beta version from Ubuntu Tweak PPA. Both Natty and Oneiric packages are available but in my testing many features did not work on Oneiric. Also Ubuntu Tweak detected Gnome 2 on Oneiric and not Gnome 3 so it is probably more useful on Natty at this time.